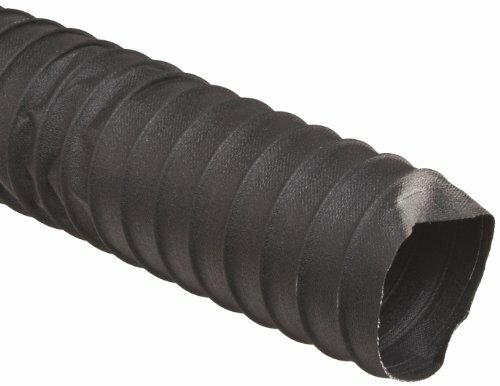 The Flexaust CWGP polyester duct hose, used for dust control, landfill venting, and mining ventilation, is a black, double-ply, neoprene-coated polyester fabric hose, reinforced with a spring steel wire helix; it resists chemicals and external abrasion, and is very flexible and highly compressible for easy manipulation. A temperature range of -40 to 250 degrees F makes it suitable for applications such as industrial ventilation, landfill venting, and dust extraction. This duct hose is made from flame-retardant materials per the UL 94V-0 Flammability standard, and is available with additional coatings for greater abrasion and chemical resistance. A conductive version (Conduct-O-Flex) is also available. Duct hoses are flexible or rigid tubes that convey gases, liquids, and lightweight bulk materials from one location to another. They are made from an array of materials that range from polyurethane and thermoplastic rubber, to PVC and aluminum-coated fiberglass fabric, and are typically reinforced with a steel wire or rigid plastic helix, also known as a “spiral.” Duct hoses are secured with hose clamps or U-bolts, and two pieces of hose are joined with a hose connector. Common applications for duct hoses include heating and cooling, ventilation, fume and smoke exhaust, vacuum cleaning, moving chips and shavings, handling bulk packing materials, and water and waste discharge. Flexaust manufactures flexible hose, metal ducting, and accessories for industrial and commercial applications. The company, founded in 1938 and headquartered in San Diego, CA, is part of the international Schauenburg Group.